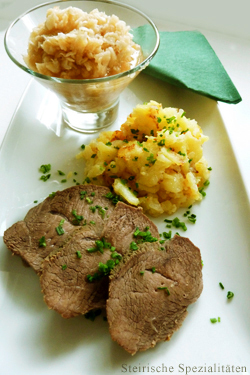 Boiled beef is a German and Austrian specialty. For example in the German city Frankfurt your can find the dish boiled beef with green sauce in almost every good restaurant. In Austria they serve the beef with a special sauce made out of apples and horseradish. It is important to get the right meat for this dish. Happy Cooking! - Tie the meat with a string so it won't lose its shape. - Place beef in a pot and add cold water (the beef needs to be completely covered). - Add the vegetable, cleaned and cut into smaller pieces to the meat (don't cut the onion). - Bring to a boil, then reduce heat, cover it and let simmer for about 2 hours (until meat is completely tender; test with a fork a pointed knife). - Remove meat and vegetable from the broth, and keep it warm (covered with foil). - Add salt, pepper, nutmeg to the broth. Make a soup out of it by adding the thin German soup noodles. - Slice the meat and place it on a warm platter, sprinkle it with chopped parsley. 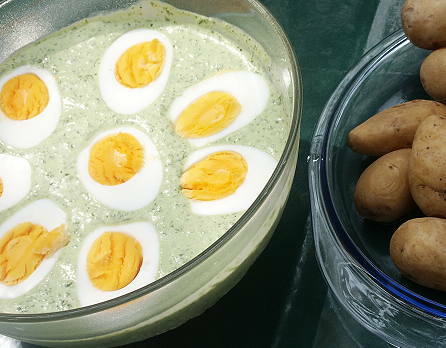 - Serve it with green sauce, boiled potatoes or fried potatoes. In Austria they serve "Apfelkren" with the meat. Apfelkren is a mix of horseradish with apples. Apfelmost (alternatively apple juice with a splash of vinegar). Peel apples, grate them and mix with the juice. Add salt and horseradish, mix well.